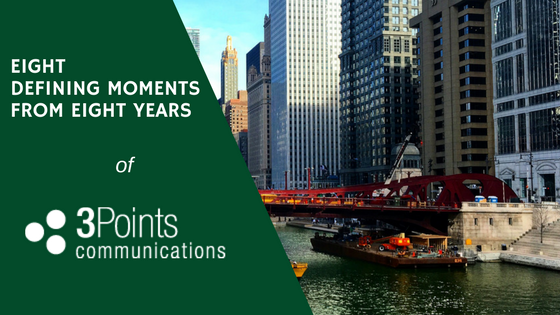 Yesterday marked the 8-year anniversary of 3Points Communications. I started 3Points on April 5th, 2010, working out of my apartment’s second bedroom, because I had built a good reputation in the trading industry as a comms pro and had benefited from mentorship at my previous job (and I had a lot more time on my hands, since it was before I became a dad!). It’s been quite the journey, from working as a team of one to today working with a team of eight dedicated and highly motivated professionals in our modern 9th floor office in the Loop. Coincidentally, yesterday was also memorable for another reason: the Chicago Stock Exchange (CHX), a long-time client of ours, entered into an agreement to be acquired by the Intercontinental Exchange. Just a few years ago, many people in the industry were surprised to find out that CHX was still in business. Now they have scored a big deal with the world’s foremost exchange operator. I’m extremely proud of the CHX team, and of the fact that we’ve been able to play a part in getting them to this point. So as I was thinking back on the past eight years, I was also thinking of other key moments and events that stick in my mind. I wanted to write down those moments, partially because I have a habit of writing things down, but also because I think they could be of interest to those who are curious about our business and those who are in the process of growing small businesses themselves. Taking on our first client, Hehmeyer Trading Group (HTG). This is an obvious place to start, and frankly, there would not be a 3Points today if it weren’t for Chris Hehmeyer signing on with 3Points in 2010. And I’m proud of the fact that HTG (now Hehmeyer Trading & Investments) has remained a 3Points client since Day One. We strive to be more than just a PR “vendor” — we want to be long-term partners to our clients, and we’re thrilled to have multiple clients like Hehmeyer, who have trusted us for years. Getting hired by a Nobel laureate. In early 2014, we signed on with the University of Chicago’s Becker Friedman Institute for Research in Economics (BFI). BFI’s director, Lars Peter Hansen, had recently won the Nobel Memorial Prize in Economics, and the institute realized that it needed PR in place. This was significant for us for two reasons: 1) it was the first time a major prospect had actually reached out to us, rather than vice versa, and 2) partnering with a Nobel laureate gave us the confidence that our firm was a true player in Chicago PR. Chicago’s biggest tech exit of 2016. One of our earliest clients was online brokerage tradeMONSTER, which we helped grow from a startup to a top-ranked firm in the industry. We saw them through a merger with OptionsHouse in 2015, and continued doing their PR until the new company was acquired by E-Trade for $725M. This was the largest tech exit in Chicago that year. A client buying another client. Keeping on that theme (clearly, acquisitions are on my mind at the moment, but they really are momentous for our clients), I’m extremely proud of Trading Technologies (a 3Points client) purchasing Neurensic (another 3Points client) last year. Not only did our years of PR work showcase both parties as attractive business partners, but we were able to catalyze the connection between the two companies that led to an win/win deal. T4Youth. Okay, I know T4Youth is technically not just one event — there have been four annual events since we co-founded the tournament in 2014, and we are proud of each of them. We love helping put the event together each year and plan to keep going. Between the four previous events, we’ve raised over $300k for Chicago Tech Academy. Whether it’s T4Youth, working with various initiatives promoting women in finance, or sponsoring actual three pointers, giving back has been a crucial part of 3Points’ journey. Life beyond trading tech. Becoming a partner of Hyde Park Angels in autumn 2017 was a big step for 3Points — and not just because we became HPA’s first and only PR firm partner, but also because it provided us an opportunity to build relationships with its portfolio companies, burgeoning businesses in a variety of fields. This partnership was part of a larger expansion from our original fintech niche into the broader Chicago tech world. In the past year, we’ve begun assisting a variety of clients across a range of industries, such as Panoskin (360-degree photography), Otus (edtech), and Treatail (e-commerce). Earning recognition as a leading PR firm. As a professional services firm, the best measure of our success is the success of our clients. However, it is still meaningful to receive recognition as an agency, like the silver award 3Points received in the 2017 PR World Awards or our inclusion in Expertise’s list of Top Chicago PR firms. Those instances of recognition serve as fuel for us to redouble our efforts and maintain our client-centric attitude. Implementing a shareholder plan. I may be the one writing this blog post, but this isn’t the story of my success. 3Points is a team effort. I can’t express enough how thankful I am for every past and present employee (including interns) who have contributed to 3Points’ growth. As a company, we’ve made tremendous strides in building our internal structure to reward 3Pointers for all they do, but the biggest one is implementing an employee shareholder plan last year. As I said, this isn’t my story, it’s our story. And with this plan, it’s our company. Eight years down. Many more to come. I can only hope that these upcoming years will be as rewarding and fulfilling as these past eight.